The samurai of old Japan were well-known for their loyalty and their virtue, as well as for their love and respect of the sword. This Samurai Bushido Table Top Stand will accommodate one katana, giving it a home worthy of its ancestral legacy. This sword stand has a classic and iconic design, featuring a base with a low-set horizontal support and two leveled risers that hold a sword and keep it aloft, as if offering it to the first hand that reaches for one. Inscribed on the support, in faded yellow-gold coloration, are the Japanese kanji for Bushido, literally translated as the way of the warrior. 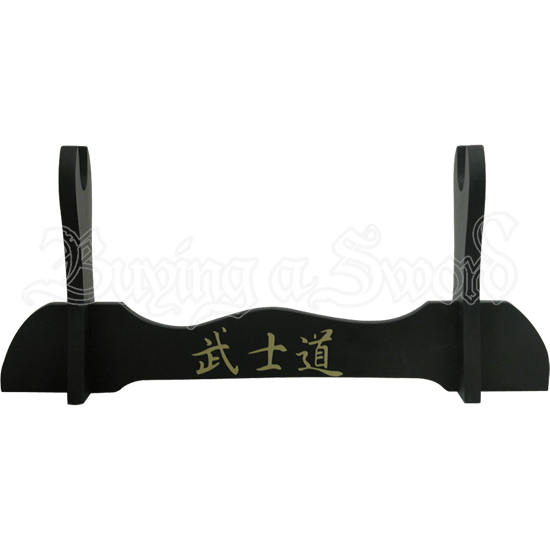 Given its Japanese styling, this Samurai Bushido Table Top Stand makes for a fantastic accent to add to your collection of similarly styled swords, serving to enhance the symbolic look of any katana, wakizashi, chokuto, or shirasaya that it is paired with.